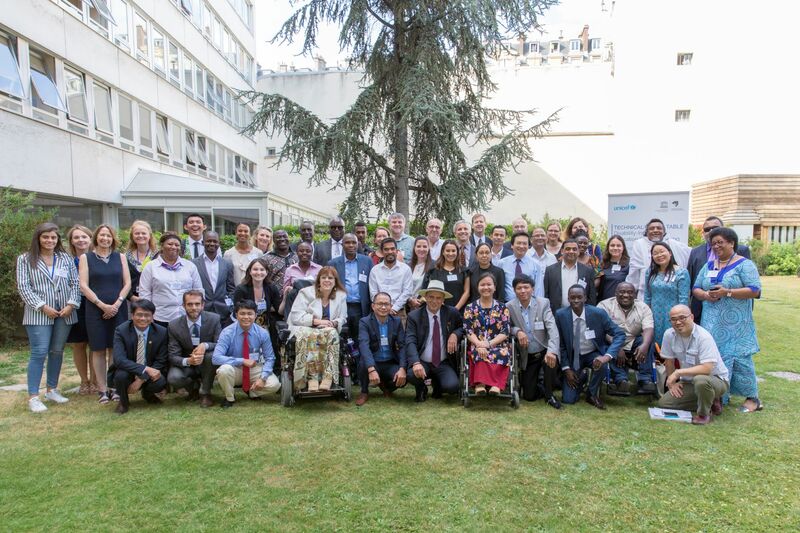 Recently, our director, Sandy Usswald, was invited to Paris by UNICEF to be a part of their Technical Round Table on Disability Inclusive Education Sector Planning. Below are some of the details about what was discussed during the round table. The purpose of the round table was to interrogate the Inclusive Education Framework regarding each country’s context. The format of the meeting was that an expert would provide a short introduction about the framework aspect to discuss after which a panel discussion was held by chosen countries to share their experiences and successes in their respective countries. Ghana and South Africa (Andre Viviers – Unicef and Sandy Usswald – SADA and Autism South Africa) were part of the panel. It was rather frustrating that our relevant DSD and DBE representatives did not make the meeting as they were better suited to report on successes. We tried our best though to represent South Africa as fairly and honestly as possible. During the three day meeting we did try to reach out to DBE for input, but were not successful. Ghana has just completed an Education Sector Analysis where they were able to identify the gaps in their education sector and are now embarking on deep analysis and planning procedure. SA was asked how we were successful in getting the stakeholders involved to embark on inclusive education planning. In South Africa our policy and legislation is a very enabling environment, however implementation remains a problem. SA still has a special school focus for children with disabilities. We are far behind deadlines for inclusive education and require a stern monitoring mechanism. Vietnam, Fiji, Ethiopia and Ghana were on the panel. Data collection together with a realistic costing (financial simulation model) is a vital part of identifying and planning for the needs of children with disabilities in the mainstream school environments. The cost of inaction is far higher than inclusion of children with disabilities. A slogan of the meeting was devised during this panel: “Finance is not the problem, it is the solution”. Fiji has just successfully implemented FEMIS, a data collection tool in their education sector. They however only have 15 000 children with disabilities in their country, with a total population of 1 million. Kenya, Ghana, Vietnam and Nepal were part of the panel. Kenya has just embarked on a successful inclusive education training programme for their educators at schools. They are struggling to motivate for inclusive education however as their special needs educators receive financial incentives for working in special schools. Nepal has a scholarship programme for all children with disabilities which include transportation, school fees (residential and non-residential) which accounts for approximately 60 000 children with disabilities. They also have an extremely close and good relationship between CSO and government. Vietnam estimates that they have approximately 1.3 million children with disabilities and they have recently abolished all school fees for these children. Fiji, Nepal, Ethiopia and South Africa were part of the panel. Negative attitudes (or perceptions as I prefer) of management and educators of inclusive education is a barrier that most countries face. It was suggested that the Communication for Development (C4D) Unicef programme be looked at, they provide practical tools to create social change which starts with change to attitudes. There are cross-cutting issues that all the countries face, such as gender discrimination (compounded vulnerability), poverty and low resource settings. How can a child learn in whatever environment if he/she is hungry? Cambodia and South Africa were a part of this panel. I reported back extensively on the SIAS – a tool for screening, identification, assessment and support is which is being rolled out in South Africa. Approximately 30 000 educators have been trained in the SIAS. It is not clear however how effectively this tool is being used. Cambodia reported on a hearing screening app which they have rolled out to schools. Andre reported that we have a similar app in South Africa called HearScreen and one looking at visual screening too. Early Childhood Development was a theme that ran throughout the three-day round-table. The earlier we can identify children with any type of learning difference, the earlier we can provide supports to ensure their progress and success into adulthood. It is clear that DSD and DBE need to carefully work together to ensure smooth transitions, incorporating the services of DoH. At the end of day three, countries were required to come up with ‘Next steps’ or ‘Action Plans’. This was however not possible for South Africa as both representatives were from NGO’s and do not have the power to make any top-line decisions in government. We however undertook to report back to the Department of Education. In conclusion, I thank everyone for their trust in me to represent SADA at this round-table. I was outspoken and true to the realities that we face. A specific thank you to the SADA exco. Thank you to Blind SA and Epilepsy SA for their input regarding the South African presentation. I included your comments in the SWOT analysis and panel discussions.